2011rogerb has no other items for sale. The official Nintendo AC power adapter for the 3DS carries the Nintendo seal of quality. That means it's fully compatible with all Nintendo 3DS units. The 3DS charger jack is designed with proprietary components, and it's made with those components in mind. You simply plug one end into your handheld game console and the other into the wall. Fast Delivery, Smooth Transaction, Pleasure!!!!!! Recieved item. 3DS doesnt come with charger. It works fine. If you need a charger-and you know Nintendo does not provide on for you....Then this one is real! I always like the accessories that are official because they actually work!!! Sometimes the off brands are not very good. Really a great deal and the real thing! 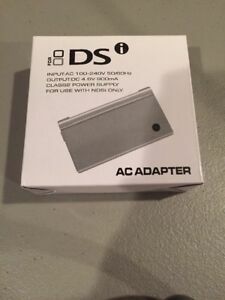 Official adapter for the New 3DS XL all the way down to the 2DS. High quality. Works wonderfully. Highly recommend, especially over cheaper knock off versions that give out too quickly. It works well and was in great shape. Definitely would buy again.